We engage in complete financial planning with our clients, which ensures that we gain a clear understanding of your goals, objectives and current circumstances. We then use our resources, knowledge and expertise to provide advice and develop a long-term relationship of trust and understanding. We believe that your financial plan needs to be dynamic and responsive to your changing life and needs. 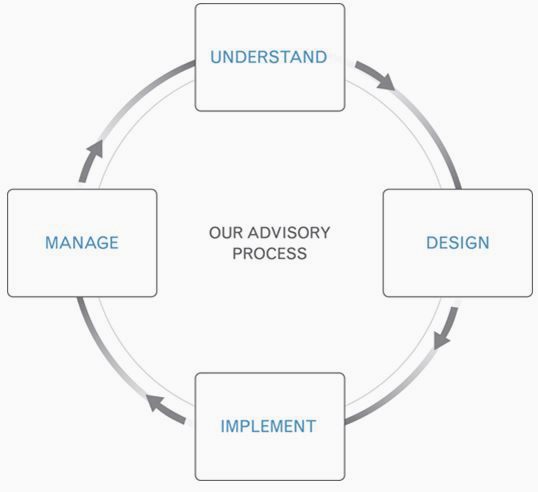 To develop a plan personalized to your individual needs, situation and investment style, we follow the comprehensive, four-step process that we have developed and refined. It is designed to help us gain a true sense of who you are and what you expect. Every client is unique, and we want to know exactly where you are, how you got there and where you see yourself in the future. We assemble all information regarding your financial situation, mutually define your personal and financial goals, understand your time frame for results and discuss your tolerance level for risk. We assess your current situation and determine what actions are required to meet your goals. This step may include analyzing your assets, liabilities, cash flow, insurance coverage, investments and tax strategies. This is vital information we need before moving forward, and provides us clarity. Based on this information, we will propose financial strategies and discuss the implications they will have on your financial affairs now – and in the future. Our goal is to help you make informed decisions. We carefully listen to your questions and concerns and revise our recommendations, as appropriate. Once the financial plan meets with your approval, we carry out our recommendations, coordinating the process with you and, when appropriate, engaging your other professional advisors such as your accountant or attorney. Our process is dynamic and fluid. As your life unfolds and your needs evolve, we put all of the pieces of the puzzle together. We engage every service provider to ensure that you will always have the complete picture. We never lose sight of what matters to you. We monitor your progress through our proprietary Life Planning Dashboard and Goal Planning & Monitoring systems so that you have the confidence to know you are staying on track. Built on the five pillars of financial planning, the dashboard focuses on areas including retirement, investment, estate, tax and risk planning. This unique approach provides actionable steps to keep you on track as your life unfolds. Whether you’re 30 years old and starting a family, 50 years old and selling a business, 65 years old and looking to retirement – or anywhere in between – this customized road map shows you steps to incorporate a healthy financial plan in your life. Progress meters provide accountability to show those areas where your plan is strong, and identify areas of concern to address for continued success. This collaborative tool helps us work with you to build and compare multiple scenarios side-by-side – helping us see how different decisions, strategies or risks affect the likelihood of meeting all of your goals. We “stress test” your plan to help ensure it can withstand the unexpected, such as inflation, changes in your or your family’s health needs, or even an unexpected death. We will update your plan continuously, and you can track your progress online at any time by logging into your account via Investor Access. You want your money to work as hard as you do, and you deserve a team who can help make sure it does. Reach out to us to begin receiving the attention you deserve and to create a wealth plan that’s distinctly yours.